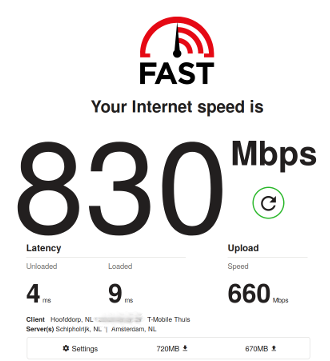 T-Mobile Thuis (which used to be Vodafone Thuis, but had to be split-off from Vodafone due to anti-compete measures) does have it's own infrastructure in my area, which means they can provide their own networking products. This translates into getting a symmetrical 750 mbit connection for €40,- per month (Sold as €50,- with a permanent 10,- discount). It can also include voice and TV-services, but these cost extra, and would only with if you let T-Mobile control your network by using their router. Sadly they still don't provide any form of native IPv6 connectivity, and I'm not too fond of letting ISP's control my routers and internet-infrastucture, so I looked into ways to get a fast and affordable connection whule using my own router, preferably running OpenWRT. I initially used a RouterBoard RB750Gr3, since I was already using that as a router for my Tweak connection, but I also had a few Edgerouter ER-X's around. Both routers basically are the same chipset, but with slightly different peripherals. The RB750 has a low amount of flash, but USB and MicroSD ports, so you can add external storage, the ER-X has no USB or MicroSD, but has 256MB of built-in flash, which is more then enough for everything you might want to install on it. Both routers would be more then sufficient and powerful enough to route a gigabit connection, as they have 256MB of RAM, and a quad-core Mips24 800Mhz cpu. In the end I swapped out the RB750 for the ER-X, since I had a few of those and only one RB750 and would have no use for the USB port on the router. Get a router with an SFP port,and use the SFP module that is provided by T-Mobile, as their own router also uses an SFP-port. This is most useful when the T-Mobile/Guidion mechanic has set-up your connection. Use a media-converter. In my case, there was already a media-converter present, since this was the solution used by my two previous ISP's. This box connects to the fiber, and outputs the conneciton over a RJ45 connection. I used this connection to hoop up to the OpenWRT routers WAN port using a CAT5e cable. T-Mobile Thuis uses a few different VLAN's, but for our use we only need to use the regular internet VLAN, which is vlan 300. Besides this vlan there is also vlan 100, which is used for T-Mobile's management and vlan 640, which is used for TV. The internet vlan (300) will give you a public IPv4 address using a DHCP-request. This will also be the default gateway. The Management-lan (100) wil also respond to DHCP-requests, but only return adresses in 10.66.0.0/16 ip-space. There is some traffic on this network, but I haven't looked into it too much yet. Posts on various forums informed me that IP-TV is normally configured on the 640 vlan. I myself don't use much TV, so I haven't done any configuration yet. T-Mobile also lets you use TV-Anywhere, which is a mobile application (IOS/Android) for streaming TV on any internet-connection, so this can be used as a zero-configuration alternative. I might update this post or publish a new one when I get TV-Streaming working, but I'll probably cancel the TV and voice subscriptions before too long, I only took them because it was cheaper with then without (the first 6 months).